This is our guide on how to grill with charcoal here we cover all of the basics to get you grilling correctly. 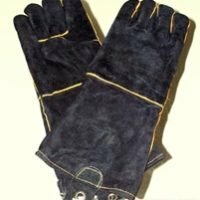 If you just purchased your first charcoal grill take your time and read this post. It won’t make you an expert but it will give you the tools you need to get started. 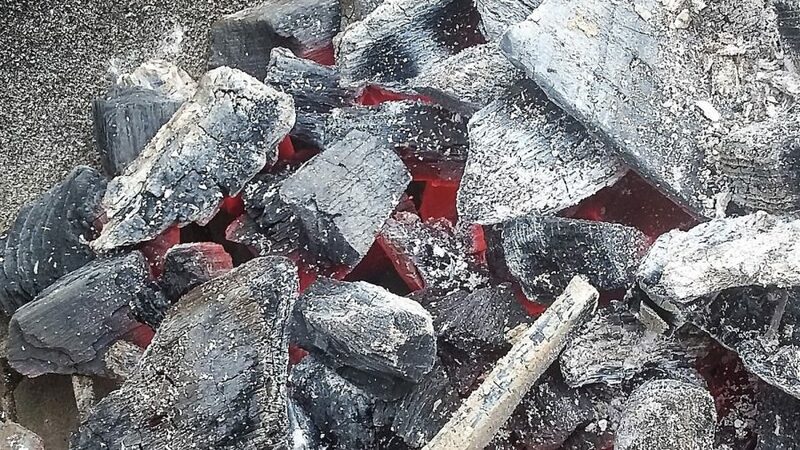 Charcoal is nothing more than wood that is burned with limited oxygen, when in a processed briquette it may contain coal and other ingredients. While grilling with charcoal is a little more difficult than using propane, the reward for that extra effort is getting an extra layer of flavor on your grilled food. We are not going to compare brand name charcoals here: we are talking about processed briquettes verses natural lump charcoal. 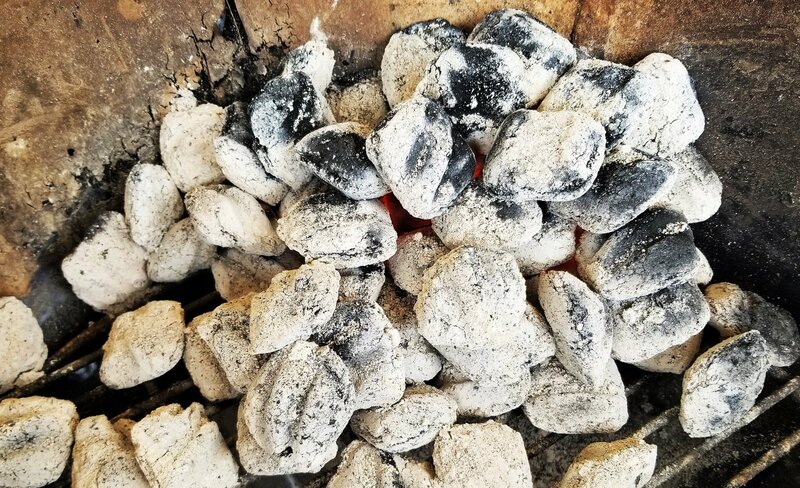 Processed Charcoal Briquettes are available most anywhere during grilling season, they are affordable and they are a consistent size and shape. While consistency has its place in grilling most people buy them because they are readily available. 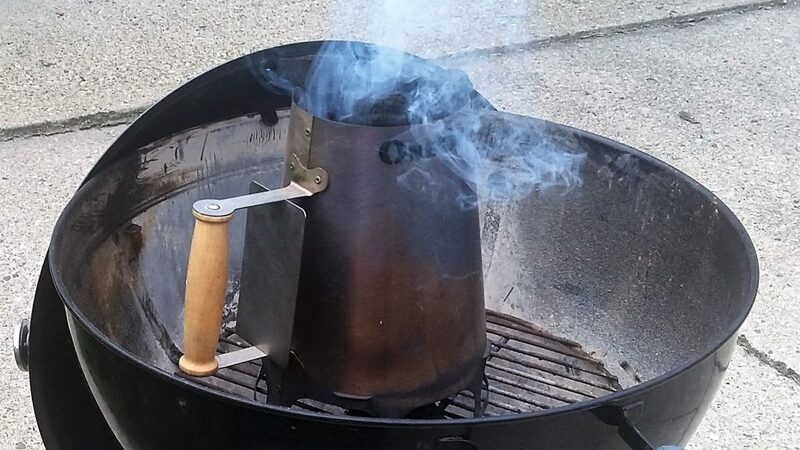 Natural Lump Charcoal burns hotter, cleaner and sometimes longer than store-bought charcoal briquettes. The drawbacks are sometimes it is hard to find and because it is natural it varies in size and shape. So it may burn slightly hotter or cooler depending on the load. Typically you will always find Natural Lump charcoal where organic foods are sold. Brand names of this type of charcoal will vary by the region of the country that you live in. Not to long ago everyone that used charcoal would use lighter fluid to light it. Now you find the use of lighter fluid less and less. I think we all miss the giant ball of flame that used to be the ceremonial lighting of the grill that started the outdoor barbecue. However no one misses the taste of it. Now you have a few different ways to get your charcoal stared without the use of lighter fluid. The credit for inventing this tool is typically given to the Boy Scouts.They used a household coffee can and wire hangers. They have come a long way since then even though the concept has not changed. A Charcoal Chimney is a typically round container with the inside separated into two chambers. With either wire or metal plate with holes and a handle. The chambers are usually separated into 1/3 and 2/3 the size of the container. The 1/3 side is the bottom of the chimney where the newspaper goes and the to 2/3 is where you place the charcoal. To use a charcoal chimney you start with 2 to 4 sheets of newspaper this depends on the diameter of your chimney. Loosely crumple each sheet of paper into a ball about twice the size of your fist. Place them into the bottom of the chimney. Do not pack it tight or it will not burn properly. Pull some of the edges of the paper through the holes on the bottom of the chimney. 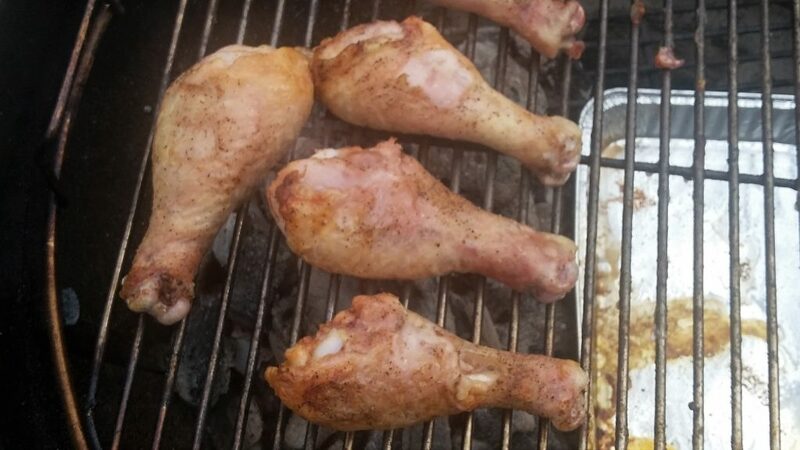 Place the chimney in the bottom of your grill. Add your charcoal to the top of the chimney. fill to the top. Light the ends of the newspaper that you pulled out. Do not cover your grill at this point. In 20 to 30 minutes your charcoal will be ready to go. With grill gloves on grab the handle of the chimney and pour out the charcoal. Set the hot chimney down in a safe place to cool. You may add new charcoal to your fire at this point. Place your grate on and you are good to go. Temperature control with charcoal is fairly easy with a little practice. 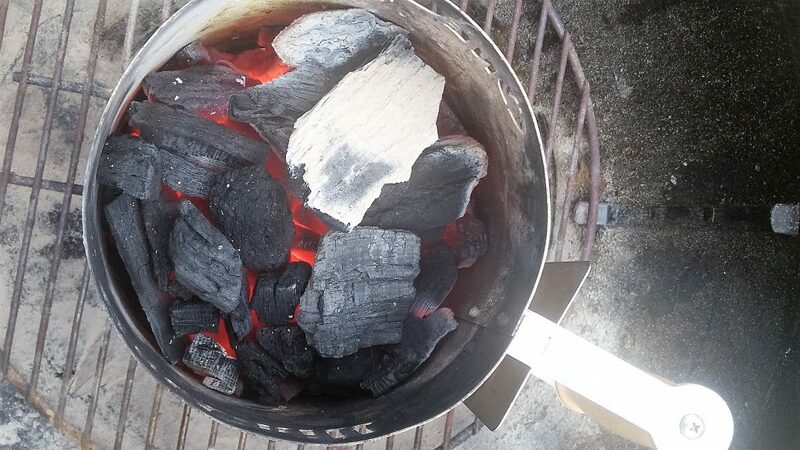 The way to control the temperature starts with the amount of charcoal you use. The mistake most beginners make is filling the entire bottom of their grill with coals. I know this mistake from experience having peeled the paint off the inside of my first charcoal grill. More coals equal more heat less coals less heat. Both of the air vents of your charcoal grill should be fully open to start with. These vents are for fine tuning the grills temperature while cooking. Opening the vents increases the heat closing them decreases the heat. It is best to only use the lower vent for heat control. You will need to check that the lower vent is not clogged with ash every once in a while. When you are cooking both vents should never be fully closed. This will choke off your fire. 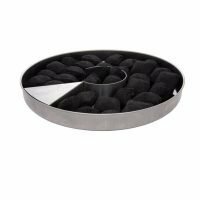 Creating multiple heat zones: Start by using enough coals to fill about a third of the bottom grate with a double layer of your coals. You will want the coals piled up on one side of the grill. Tapering down to a single layer past the middle of the grill. Have no coals on the one edge of the lower grill grate. This creates 3 distinct temperature zones hot, medium hot and medium. Start you food in the hot zone to sear it. Once the food is seared move the food to the center for more cooking. If you experience flare ups or some pieces are cooking faster than others. Move them to the side of the grill with no coals. Believe it or not too much smoke can be a bad thing and add a bitter taste to your food. When you first get your charcoal lit you will notice a heavy gray smoke. Eventually that will turn into just a wisp of light gray smoke. Cold coals cause that gray smoke. As the pile of coals heat up you get less smoke. When you pour the coals out of a chimney the smoke will thicken temporarily then clear. This also happens when you add more coals to your fire. This is one of the keys for how to grill with charcoal, a bitter taste to your food will ruin all that hard work. If you can wait until the smoke reduces itself to a wisp. You will not get the bitter smoke taste in your food. Professional barbecuers will preheat the coals and logs before tossing them into the hot fire. This is to minimize this affect. That is it for the basics of how to grill with charcoal. Now you can get out there and grill with confidence. This Page contains links to 4thegrill’s products andrevenue generating ads from Amazon. 4TheGrill is not responsible for the content of the off site links we provide. This is our guide on how to grill with charcoal here we cover all of the basics to get you grilling correctly. 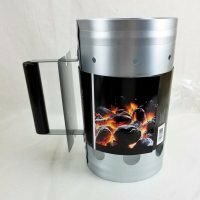 If you just purchased your first charcoal grill take your time and read this post.